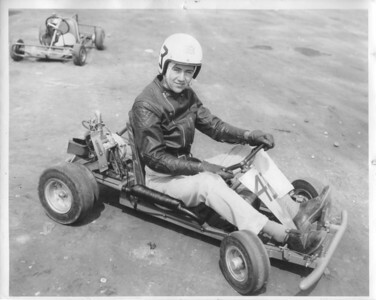 1960, my 2nd kart, this Magnesium kart was built by Kelvin Industries in Oshawa Ontario, photo at the Mt. Forest Go-Kart track. Note: also the rotary valve on the McCulloch engine, also built by Kelvin Industries, replacing the inefficient reed valve. Now all go kart race engine use rotary valves. Such wonderful people they were. 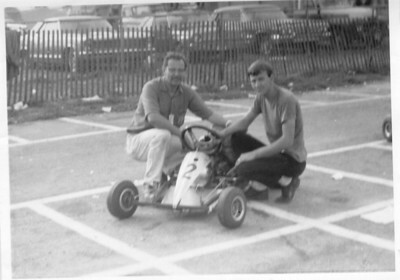 The Bantam Kart was built in Ohio, were we use to race frequently. Mansfield was a great and fast track. I love the fast tracks. 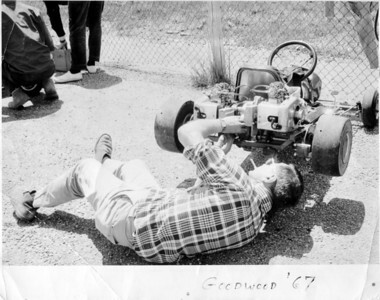 Dad at work on our last and fastest version, before turning to Formula Ford in 1968. Photo at Goodwood, Ontario. 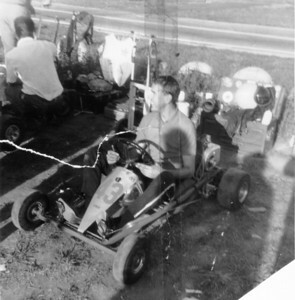 We raced Go-Karts from 1962 - 1967 in Ontario, Quebec, NY, Ohio, Michigan and Illnois. 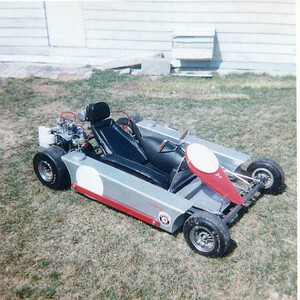 This was our last and fastest version; seen her at the Goodwood kart track in S.Ontario. This is an SAE chassis, by Jerry Solt of Sandusky Ohio, 2 West Bend engines running methanol fuels coupled to an all alloy single speed quick change gear box, Airhart twin disk brakes with custom made disks. This kart could lift both front wheels off the grounds during straight line acceleration! 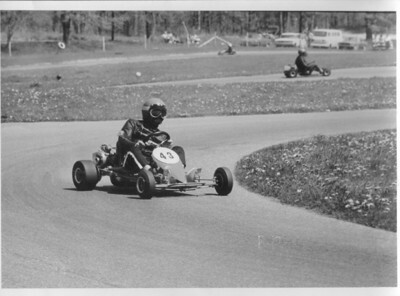 We also ran SAE enduro karts at Mid-Ohio, VIR, 1/4 mile paved ovals, a Michigan street race and others. I still can smell that lovely methanol fuel exhaust. 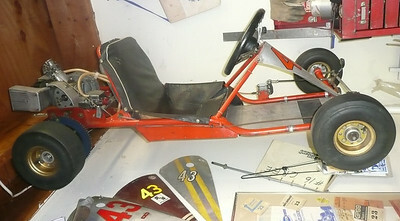 This endure kart was a clone design based upon a SAE chassis. It was designed and built by our friend Al Wright in London Ontario. Al made beautiful things. 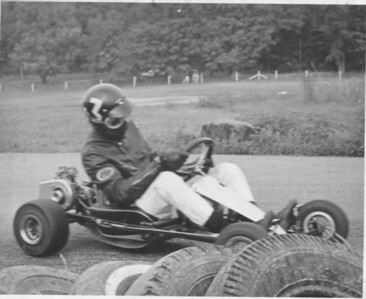 Goodwood Kart track, Goodwood Ontario; SAE chassis with twin West Bend motors, by Jerry Solt of Sandusky Ohio, Under acceleration it could lift the front wheels off the ground.